Maldives, voting is underway for the Presidential elections in which incumbent President Abdullah Yameen is in a straight contest with Joint opposition candidate Ibrahim Mohamed Solih. The voting has been brisk so far and 472 ballot boxes have been set up for the purpose. 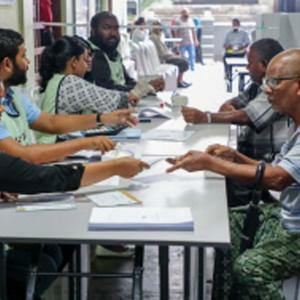 Dozens of people had gathered outside ballot centres before they opened in capital Malé and also in Colombo, which is home to a sizable diaspora. Both candidates cast their votes in Male this morning. Around 262,000 people are eligible to vote during elections which is third in country’s history after it switched over to full-pledged democracy in 2008. Counting will begin after the polling ends this afternoon and provisional results are expected by late night or tomorrow morning. A candidate must secure 50 percent of the vote to win. The elections are being held amid fears by the opposition and foreign monitors of election commission involvement in rigging the polls in favour of President. Police raided the campaign headquarters of the opposition Maldivian Democratic Party last evening and searched the building for several hours. Maldives government had imposed emergency in the country in February after Supreme Court ruled for fair trial of convicted opposition leaders including former President Nasheed, who is in exile now.